Arsenal manager Arsene Wenger says Uefa should punish clubs that break its financial fair play (FFP) rules by excluding them from European football. Nine clubs are being dealt with by Uefa for FFP breaches, with Manchester City yet to resolve their sanctions. Wenger, 64, thinks a ban from European competition is a fair punishment. "You would think that you accept the rules and you're in the competition, or you don't accept the rules and you're not in the competition," he said. "There are rules. You respect them or you don't respect them. If you don't respect them you have to be punished." Negotiations between City and Uefa over a potential deal on financial and sporting sanctions for breaching financial fair play rules have concluded for the weekend. There has been no official word from on the state of the talks but BBC Sport understands the situation regarding all nine clubs that failed the European organisation's 'break-even' test may become clearer on Monday. That would include whether City have agreed to accept a reported £50m fine and have their Champions League squad reduced from the standard 25 players to 21. A wage cap which would peg City's spending on that squad to this season's levels is also believed to have been levied. The other 8 clubs under examination by Uefa's independent financial investigators - including Qatari owned Paris Saint Germain - are thought to have agreed deals or are on the verge of accepting a settlement. However, City officials are thought to have baulked at the penalties offered to them for contravening Uefa's 'break-even' test by the governing body's independent investigatory panel. 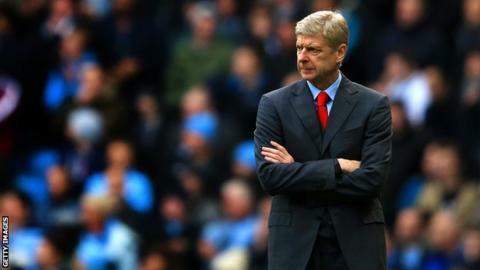 Arsenal boss Wenger believes the sanctions imposed on clubs used by Uefa must be more straightforward. "From all of us on the outside, it looks a complicated punishment, which nobody really understands," Wenger added. A late deal between City and Uefa remains a possibility but if no agreement is made before Friday's deadline then City's case will proceed to Uefa's independent adjudicatory panel, headed by two European Court justices. That decision will be non-negotiable - bar a potential appeal to the Court of Arbitration for Sport (Cas) - and could see the club hit with a far harsher penalty than the one currently on offer to them.